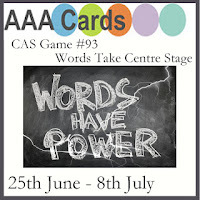 I have a post today for the AAA Card Challenge with the theme of "Words Have Power". This was perfect for me to do since I recently purchased a stamp with words so powerful that it needs little else to make a beautiful card. I don't buy too many stamps in this style, but I loved this one and I hope there will be others that speak to me this strongly in the future. Before I stamped the saying, I did a watercolor wash on my background panel (made from Canson Bristol Watercolor Paper) and let it dry. I wanted to keep the look simple but elegant. I used Distress Inks in Picked Raspberry, Abandoned Coral and Ripe Persimmon for the wash of color. I made a few cards in this style so I used several other Distress Inks in blue's and greens for all of my panels. By the time I finished, my first panel was dry and ready to heat emboss with the saying. I stamped each panel with Versamark and heat set it using Simon Says Stamp Antique Gold Embossing Powder. Once that was done I die cut the panels using the Simon Says Stamp Stitched Rectangle Die in the largest size to cut those panels. I have lots of little Prima Flowers around from my Scrapbooking days and I have been trying to use a few of these with my cards. The small sized ones I used here are great for this kind of thing but I found that this was about the largest size I could use for a card front and in fact, used several even smaller ones on some of the cards I made. I wanted the focus to be on the sentiment not on the decorations. Encouragement or Thinking of You Cards are my favorites to make and send and I can't think of any that are more appreciated than that except maybe Thank You's. Sometimes a person gives you an ear, a hug or a word of praise or encouragement when you most need it and I don't want that person to think their kindness went unnoticed. We all need words of affirmation that what we are doing makes a difference in people's lives. I do it by making and sending cards. These particular words have great personal meaning for me. They tell the story of the journey I've been on for the last two years that altered the entire course of my life. I can't wait to see what everyone else makes for this challenge and to read their words that have power. Have a great day and thank you so much for stopping by today! Dear Vicki, I receive your email daily- thank you for all the inspiration you have given me. Todays posting--I have the same stamp and I used it earlier this year for two cards--a friend of 54 years was having back surgery and another friend of 33 years was in preparation for a bone marrow transplant. The message on this stamp was so appropriate and I am happy to say both friends procedures have been successful to date. 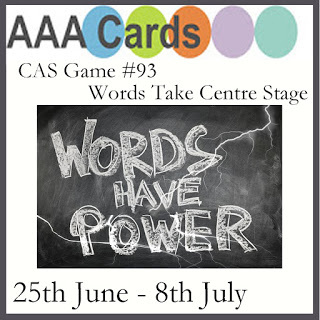 Words do have power. Thank you so much, Reva, for taking time to post this. I hope I can always bring some inspiration to your day! I don't post every single day, but I do post often. Hugs back to you! Love your pretty background colours and your verse is really uplifting. Thanks for playing at AAA Cards. Beautiful sentiment. I always say, one can learn so much from nature. Love the colors and presentation. Thank you so much for spending time with us at AAA Cards.